Music Society Date Change: Due to an adminisstrative error, the Hall has been booked for the Drama Society on 13th March, which should be one of the Society's Concert Nights. The Society has changed it's booking to the 20th March and now have a supberb replacement trio of Cello, Piano and Singer. The Society apologises for the change which was beyond their control, but were lucky enough to book these alternative artists for the following Thursday. 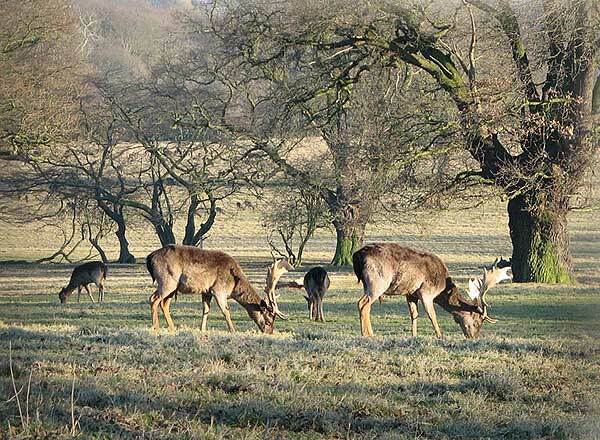 The recent good weather has allowed the deer to enjoy grazing on fresh grass in the Deer Sanctuary. China Wall Walk to Aid Breast Cancer Unit: Philippa Dooher who lives in Graylands is aiming to raise funds for research and to improve patient care on behalf of EPPING BREAST UNIT. She has been set the sum of more than £4000 to raise. She is the Lead Breast Care Specialist Nurse and is going to walk for 10 days along and beside the Great Wall of China. Staying in local farmhouses, a watch tower and very basic hotels. She goes on May 3rd 2008. If you have problems with the link you can also find me on justgiving.com under Princess Alexandra Hospital NHS Trust Charitable Fund. Theydon Bois Cricket Club Report: It is regretted that, due to unforeseen circumstances no report was produced by the Cricket Club for the December 2007 edition of the Village News. Hopefully without omitting too much detail, here is a run down of the past six months. The Senior sides had poor seasons with the first eleven ending up seventh in the first division and, after defeat in the final game of the season, the second eleven were relegated from the fourth division. It is to be hoped that, with the expected influx of players, the sides will again be near or at the top of their divisions. On the 12th October 2007 the Colts/Juniors presentation evening took place, with over sixty cricketers and parents attending. Curry was provided for those who wished to partake. In excess of thirty Colts received medals/trophies etc with the main award of player of the year going to Ryan Park and engraved medals being presented to every member of the Under 13 side and those participating in the inaugural Colts day. The Senior presentation evening took place on the 20th October 2007 with awards being made even though, due to the poor season, celebrations were muted. Indoor nets commenced on 03/02/2008 and will continue until 13/04/2008. These have been well attended, especially by the Colts. The Annual General Meeting of the Club took place on 28th January 2008 and was attended by the usual stalwarts. The Committee for the next year was elected and it is a pleasure to all concerned that the same persons as last year will serve. At the AGM an engraved salver was presented to the Club President Jerry Smith in recognition of his fifty years continuous service to the Club. Jerry had already been honoured by Essex County Cricket Club on 06/09/2007 at Chelmsford with a lunch for long serving club personnel. He has also been awarded a £1,000 Jack Petchey award for his outstanding work with young people. The money is to be used for a project associated with the Colts. Ian Stride who commences his fortieth year with the Club in 2008 with numerous years as Captain and Team Secretary. Peter Gooch who starts his thirty ninth year with the Club in 2008 as second eleven Captain and continuation of his years of service as Secretary. John Mowbray who continues his many years as Club Treasurer and player. Warren Hyde whose many years commitment to the Club as a player and worker cannot be expressed in just a few words. Matt O’Reilly who with Warren Hyde, are mainly responsible for the wonderful ground and facilities we have at Theydon, due to their hard work in maintaining them to a high standard. The Club will for the 2008 season be playing two Senior sides on Saturdays and one on Sundays with, due to the exceptional interest, Colts Under 11, Under 13 and Under 15 sides participating in cup and friendly games. If anyone is looking to join a progressive Club then come along or visit our website at www.tbcc.co.uk for any other information. Parish Councillors Eaton, Padfield, Purkiss and Hammond have, over the past eighteen months, held several meetings with the City of London to discuss the Avenue of Trees and how best to secure its future.The trees were planted in 1832 by Lieutenant Hall-Dare R.N., the then Lord of the Manor, but, although the majority of the trees are still sound ,we will need to take action over the next few years to maintain an Avenue of Trees for the future generations of the Village. Following a Meeting on the Green in November 2006 with the City of London it was felt that up to ten trees should be felled quickly, mainly on "health and safety" grounds .We argued for further evidence and a “Picus” Survey was carried out on the said trees ("Picus" scans very large trees and provides a full cross section of a tree stem in a colour two dimensional image illustrating fungal decay ). Following the Picus survey only four of the ten trees were felled . The City of London have now appointed LizLake, Landscape Architects, to present a number of different options as to how the Avenue and Village Green could develop in the years to come. The Superintendent of Epping Forest, Mat Roberts, presented eight options to the public at the Parish Council Meeting held at the Village Hall on 31/01/08 . Over one hundred persons attended and heard that 50% of the trees could need to be felled over the next twenty years .The main reasons stated for the decline were (1), age (2), compaction of roots by traffic, and (3), salt washed from the road and air pollution. Copies of these eight options can be viewed in the Parish Office..
Councillor Hammond put forward a ninth option which would involve the closing off of the road through the Avenue of trees and the widening of The Green/Chapel Road with a roundabout at the junction of The Green/Chapel Road, Coppice Row and Piercing Hill.. The advantage of this option would be to create a single Green and to give better road management to an accident black-spot at the Piercing Hill crossroads. It would also remove the hazazardous junction at the end of the Avenue of Trees, by Tesco. Mat Roberts, who stressed that the City had no favoured option, said that they would include this new alternative scheme. He also said that this might be a good way of saving the trees for longer and reducing the liability of “Health & Safety”. Our Essex County Councillor, John Spencer said that he would investigate with Highways the option of the road closure and pledged his support to this idea. We, as a Parish Council very much appreciated the large number of residents who attended the meeting on 31st January and we would like to thank everyone for showing concern and getting involved in securing the best future for our Avenue of Trees. Wansfell College Site Appeal Inquiry Result: The Government Inspector has just released his decision with regard to the appeals against the refusals of planning permission for the two applications for the site. He dismissed the appeal with regard to Appeal B; 30A piercing Hill, 'Woodview' the former caretakers house regarding that the proposals would still detract from the openness of the Green Belt. He allowed the appeal with regard to Appeal A; 30 Piercing Hill, the former college building, allowing it to be converted into 14 flats. He has though imposed many conditions on the approval of this application that will reduce the impact on neighbours and the Green Belt. In particular he suggests that the positioning of the car park should be reconsidered and approved by EFDC first. It had been intended to demolish 30A and construct the new car park where this building now stands. While it would still be possible to do this, the refusal of the application for a replacement building for 30A further into the Green Belt Gardens make this less likely as with this and an earlier appeal refusal a replacement other than on the same spot less likely. We await the developers next move on this one! To find and read the Inspectors Report in full click here and enter 2050034 for Appeal A (30 Piercing Hill) or 2053172 for Appeal B (30A Piercing Hill) into the 'Case Reference'/click Search/ click address link/ then click the links, + 'outcome of appeal', + 'outcome', then the Decision Letter pdf. Members of the VDS committee randomly picked the 10 draw winners from the large pile of entries in the Questionnaire Prize Draw (photo above). Each winner will receive a voucher for £10 to be spent at participating village shops. The winners were: Mrs E M Janes of 4 Avenue Road, King Family of 54A Forest Drive, Mrs M Biggart of 16 Heath Drive, Mrs C Freeman of 43 Baldocks Road, Ms Bennett of 22 Blackacre Road, Mr & Mrs W J Hills of Forest Edge Coppice Row, Mr S Gant of 23 Heath Drive, Mrs Jessop of 10 Baldocks Road, Mr P Warwick-Munday of 23 Elizabeth Drive, Mr R W May of 7 Heath Drive. Nearly 25% of the forms issued were completed and returned and now the hard work of processing all the information is starting. Diane Gillespie (with some help from her husband) has taken on the mammoth task of setting up a database and entering all the information from the returned questionnaires so that the views of all who participated can be taken into account when producing the statement. The next participatory project for the Village Design Statement will be the Photo-Shoot on Saturday May 3rd when it is hoped that many villagers will turn up with their cameras to show visually what they like and dislike about our village. have been seen on foot. inappropriately parked causing a danger. with information please contact me. The other members of the Neighbourhood Policing Team for Theydon Bois are Pc Alan Lamb and Police community support officers Lizal Scott and Norma Harrison all of whom can be contacted at Epping Police Station or on the NPT - mobile phone 0779 317211. 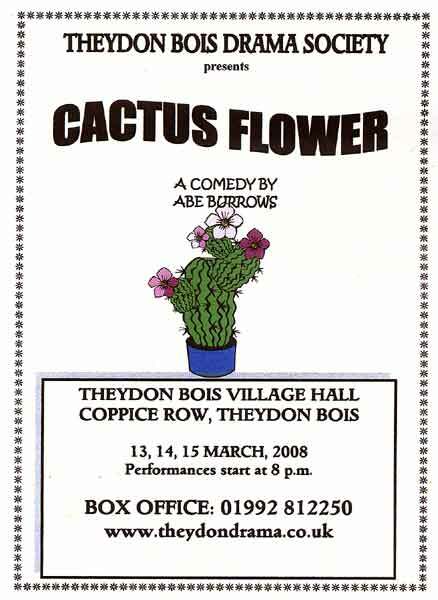 'Cactus Flower' - is a comedy by Abe Burrows; 'A mousy dental assistant is secretly in love with her boss, a womanizing bachelor.When he enlists her help to try and break up with his girlfriend, confusion and complications arise!.' Performances start at 8.00 pm, £6.50 a ticket. The following show will be in June, with full details to follow when available. Avenue of Trees; Further Presentation, 18th February: At the Parish Council meeting of 31 January Mat Roberts, the Superintendent of the City of London, who has responsibility for Epping Forest and the green, presented eight options for the future of the Avenue of trees. Option one - Replace all existing Oaks with new ones in the same position at the same time. The Superintendent confirmed that because of pollution from vehicles, root compaction due to traffic, tarmac and road salting this option may result in 50% of the new trees failing. Option two - Plant a new line of Oaks set further back from the road to create a wider avenue. Remove existing trees over time. This would visually make the Avenue appear shorter and would reduce the 'usable space' on the green. It would also 'distance' the trees from the road. Option three - Create a new avenue away from the road and remove existing trees. It could be on south side or both side of the road. Both sides of the road may lead to a cluttered appearance. Option four - Sequential felling and replacement of existing Avenue. Option five - Additional avenue perpendicular to existing Avenue. (running from Orchard Drive to the junction between The Green and Poplar Row) Existing Avenue could be removed over time or all removed at the same time. We would have an avenue in a totally different location. Option six - Additional avenue along The Green and Chapel Road (from the junction with Poplar Row to the cross roads with Coppice Row) set back from the edge. Existing Avenue could be removed over time or all removed at the same time. Would impact the light and view to / from houses located in these roads. Option seven - Plant groups or individual trees around the green to define space, views and reduce impact of surrounding urban frontages. Existing Avenue could be removed over time or all removed at the same time. We would not have a tree lined avenue at all. Option eight - Remove trees to north of road and replace with a new avenue. Re-route path to run between new avenue. Matt Roberts said these were not the only possible options and they could be combined or they would seriously consider others. Parish Councillor Peter Hammond suggested a ninth option of closing the Avenue to traffic, this would involve rerouting traffic along Chapel Road, past the Baptist Church, with possibly traffic lights or a mini roundabout at the junction of Piercing Hill / Coppice Row. This option gained a considerable amount of support from the packed meeting as it would probably preserve the present trees for longer and it could be combined with one of the other options for long term replacement. It would though would involve the permission of Essex County Council Highways Department, also any roundabout would probably have to be lit. Another alternative would be to make the Avenue 'one way' only to road traffic. It is planned that the work would be carried out over a five year time scale. The new avenue would consist of reasonably sized Oak trees, not whips or heavy standards. This consultation will be ongoing, but the 17th March 2008 maybe the last chance to get all possible options considered.. So please visit the Village Hall on MONDAY 18 FEBRUARY BETWEEN 1PM AND 8PM where Matt Roberts and his staff from the City of London will be available to discuss the situation and artistic impressions will be available for all to see. You do not have to accept one of the City of London's present 8 options. If you consider the closing of the Avenue to road traffic the best option or you have one of your own - Say So! and write it on the option form. 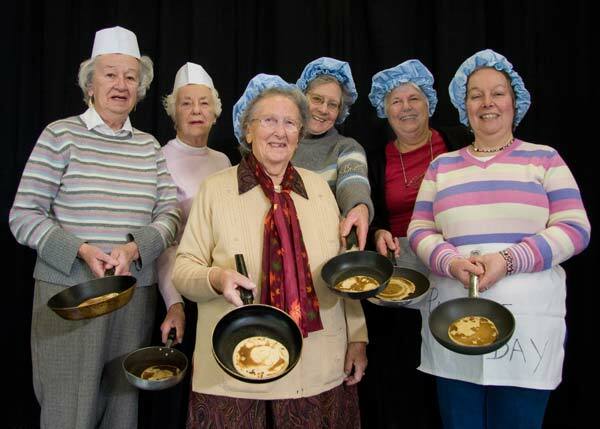 Pancake Day Tuesday 5th of February was a very successful day for Theydon Bois WI with many members and guests in attendance to see the adult and children's Pancake tossing contests together with the Spring Bonnet Parade and competition. There was of course also the opportunity to sample pancakes with tea or coffee. Children Charlie with 30 tosses. Equal second Emily and Thomas both with 26. Adult:- Maureen from Buckhurst Hill with 65. 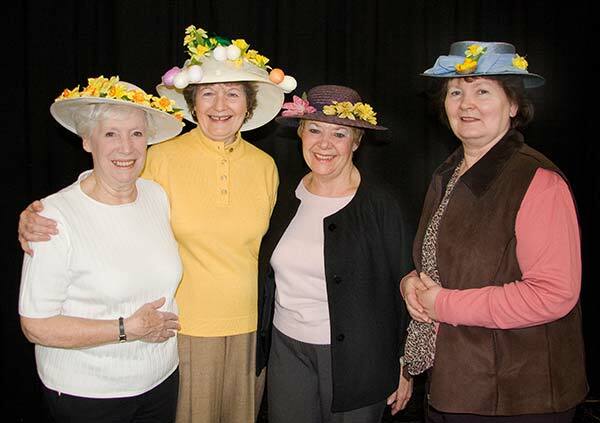 Spring Bonnets Winner was Ruby Parrott. Mat Roberts will present the options for the future of the Avenue of Trees on the Village Green. The presentation will take place at 8pm. The City of London intends to consult with villagers as to the options and it is therefore important that as many villagers as possible attend this meeting so that their views may be taken into account. Please complete the and return the VDS Questionnaire that was included with the last edition of Village News by 31st January 2008. The final statement will be very important for the future of our village and it is hoped that as many people as possible will make their views known. If you have lost yours or need further copies they can be obtained from the Parish Office or you can download one from the link below. If you need a bit of further encouragement remember there is a prize draw with £10 vouchers for the first ten completed entries drawn. Village Design Statement Questionnaire: You should have received a copy of the Theydon Bois Village Design Statement Questionnaire with your distributed copy of Theydon Bois Village News for December. If this was missing or you need further copies they are available in PDF form below. Just right click the download link and select Save As and then save in a convenient location on your computer. A few more hard copies are available from the Parish Office. but if you have completed yours, but still have not returned it, please take it to the Parish Office and we will try to include it. Please take a few minutes to complete and return this important survey by 31st January. 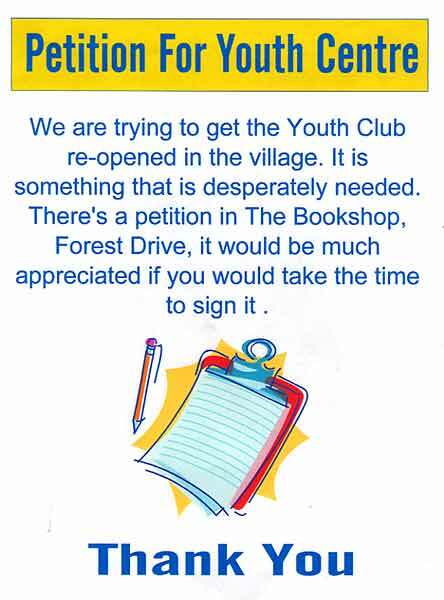 It can be returned to the Parish Office at the Village Hall or to the Village Bookshop, Forest Drive. 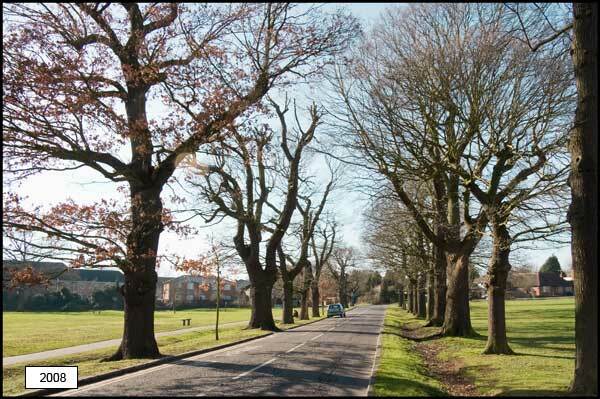 Avenue of Trees Presentation: The City of London will make a presentation about the future of the Avenue of Oak Trees prior to the commencement of the Parish Council Meeting in the Village Hall on 31st January 2008. Last year the City of London who are responsible for the trees stated it was their intention to fell up to 10 trees because of their potentially dangerous condition. After the intervention of the Parish Council and the carrying out of a Picus survey to better determine the exact condition this was reduced to 4 trees, but it is important to make decisions about probably the most important feature of our village now. The City of London have promised to fully consult villagers about the best way forward. Theydon Bois Rural Preservation Society 2008 Walks: For more than thirty years, albeit with a few gaps, the Society has organised walks from the village to explore the surrounding countryside and forest. The walks are not too strenuous, start from the village hall at 2 pm. on Sunday afternoons, last for two hours and cover about four miles. You will need stout footwear, as the ground can be wet and/or muddy in places, and suitable clothing for the time of year. The April and September walks have stiles to be negotiated. 4th May Earthworks – ancient and modern. 23 Jan. Debate on "Climate change and Global Warming are Realities we can do nothing about". 27 Feb. "Wensleydale - Rebirth of a Rural Railway"
12 Mar. "History of the Central Line"
26 Mar. "Landscapes of Britain"
9 Apr. "Adventures in the Alaskan Wilderness"
23 Apr. "My life with BT"
14 May "St. Clare Hospice. 28 May "Essex Village Signs"
11 Jun. "History of the Metropolitan Police"
25 Jun. "Jewellery and Gems"
Come and enjoy a cup of coffee followed by an interesting programme. Clubs & Societies in 2008: Thinking of taking up a new interest or hobby in 2008? 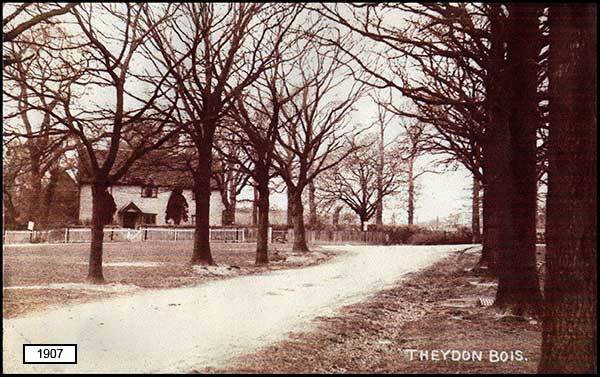 Theydon Bois has many clubs and societies catering for all sorts of interests. Many meet regularly in the Village Hall and a few easily accessed sites around the village. We have updated all the contact details on our Clubs and Societies page so that you know who to contact. If you run a club in the village and you are not listed just send us your contact details for inclusion. Wansfell Public Inquiry: It was gratifying to see so many villagers turn out for the two day public enquiry in Epping on 11th & 12th December into the appeals before the Planning Inspectorate against the decision by EFDC to refuse planning permission for the two applications for the former Wansfell College site. This site is entirely within the metropolitan Green Belt that surrounds our village. The applications were (1) for the change of use of the former college building with alterations and extensions to make 14 flats and the provision of 26 car parking spaces by demolishing the former caretakers house. (2) The replacement of number 30A (the former caretakers house) with a new dwelling further into the Green Belt gardens. While most villagers accept the need to redevelop the site villagers and EFDC thought these proposals would be harmful to the Green Belt and neighbouring properties. These proposals were in our opinion little changed from those in an earlier appeal refused by the Planning Inspectorate, they just tried to circumvent the points made in that decision. The Parish Council, Rural Preservation Society and most of the near neighbours gave evidence to the Inspector over the two days and accompanied him on the site visit. They were also able to question the appellants 'experts' who gave evidence. While the outcome will not be known for about a month the Inspector did carefully note our evidence and noted the public interest. He said "it is rare to see so many of the public attend an enquiry for its full length". Theydon Bois Friends of Cancer Research UK - Volunteer Fundraiser's Our friendly committee would like to appeal to anyone who has a few hours to spare to help this very worthwhile cause. The group was started in 1972 by a small group of dedicated ladies and has grown to a larger committee supported by family and friends where needed. Over the years we have organised a great variety of events, raising many thousands of pounds to help in the fight against Cancer. Sadly, too many families are affected by this indiscriminate disease and we need to continue our efforts to help find a cure. If you feel you would be able to help and would like to know more about us, or come along to one of our bi-monthly meetings please contact one of our members. We would be delighted to hear from you. Lynn 01992 812380 or Jean 01992 813480. Wansfell Public Enquiry: It was gratifying to see so many villagers turn out for the two day public enquiry in Epping on 11th & 12th December into the appeals before the Planning Inspectorate against the decision by EFDC to refuse planning permission for the two applications for the former Wansfell College site. This site is entirely within the metropolitan Green Belt that surrounds our village. The applications were (1) for the change of use of the former college building with alterations and extensions to make 14 flats and the provision of 26 car parking spaces by demolishing the former caretakers house. (2) The replacement of number 30A (the former caretakers house) with a new dwelling further into the Green Belt gardens. 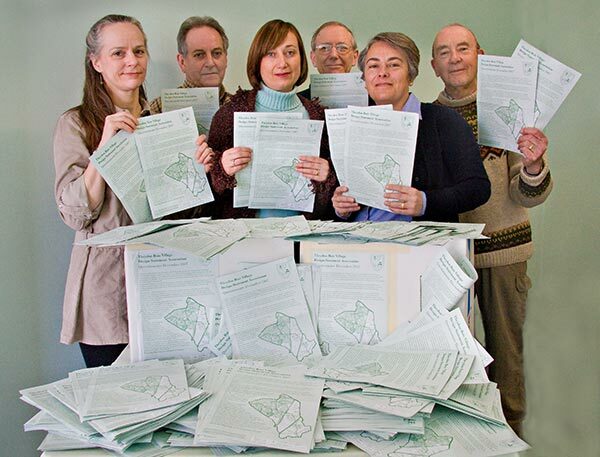 While most villagers accept the need to redevelop the site villagers and EFDC thought these proposals would be harmful to the Green Belt and neighbouring properties. These proposals were in our opinion little changed from those in an earlier appeal refused by the Planning Inspectorate, they just tried to circumvent the points made in that decision. "Set in the Kingdom of Mirth, with the usual fun pantomime characters, Grettle a young village maiden says she can turn 'flax into gold'. Unfortunately the King believes her at her word and orders her to do so or she will lose her head. She is shut in the tower, where a mysterious gnome offers to help - at a price. The play then follows the gnome's defeat by the guessing of his secret name and, despite other complications from the wicked Baron and his henchmen, all ends happily." 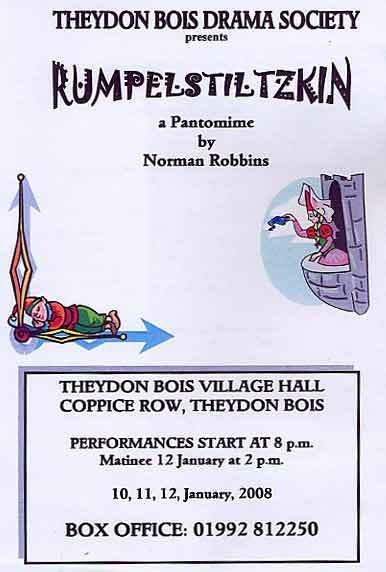 Dates are Thurs 10th - Sat 12th January 2008, including a matinee performance on the Saturday, at Theydon Bois Village Hall, Coppice Row, Theydon Bois. 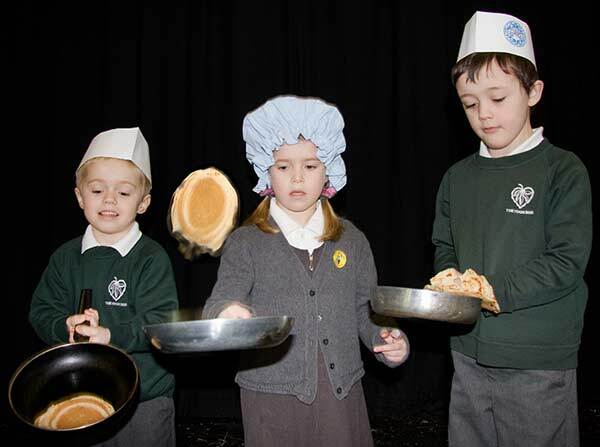 Performances start at 8.00 pm (matinee 2.00 pm), tickets are £7.00 adults, £5.00 children under 14. Box office is as always - Mr and Mrs James - 01992 812250. Village Design Statement Questionnaire: You should have received a copy of the Theydon Bois Village Design Statement Questionnaire with your distributed copy of Theydon Bois Village News for December. Incase this was missing or you need further copies they are available in PDF form below. Just right click the download link and select Save As and then save in a convenient location on your computer. A few more hard copies are available from the Parish Office. Christmas Tree Lighting Ceremony 2007: Many villagers attended this traditional ceremony to see the lights turned on by 2007 Villager of the Year, Jim Watts. 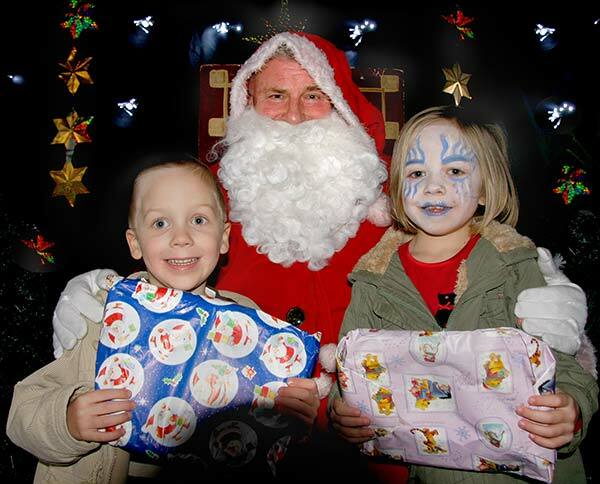 It was an excellent evening, carols were sung and Father Christmas arrived to hand out sweets to the children from his Grotto. Everyone enjoyed the mulled wine and mince pies served afterwards. During the evening a collection was made in aid of St. Clares Hospice and £489.26 was raised for this charity which does such essential work for cancer patients and their families. The Parish Council would like to thank everybody who attended and all those who kindly donated items that made the evening possible. The sweets were generously donated by Previn Khetia and his wife and Santa's Grotto was provided by John Pollock of Loughton. Nigel Howe from Theydon Bakery, kindly ensured we were well fed with mince pies and the wine was donated by the Wine Rack. Several of the sponsors have supported this event for many years and the Parish Council is extremely grateful for their continued generosity. We would also like to thank Theydon Singers and the choir from Theydon Bois Primary School accompanied by Trisha Cole, who led our singing so well. 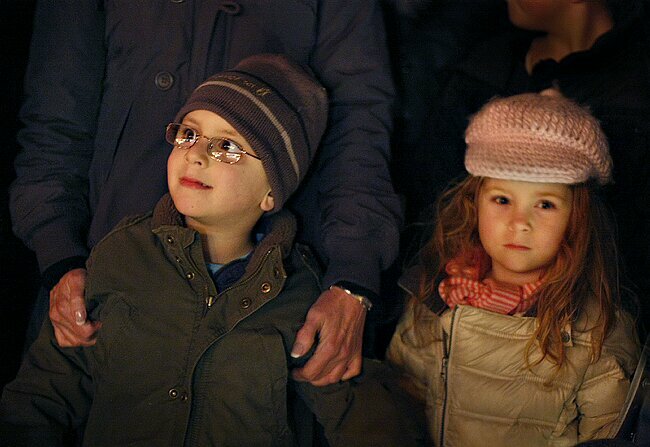 Watching the lighting of the Christmas Tree. A full set of photos from the evening can be seen here. 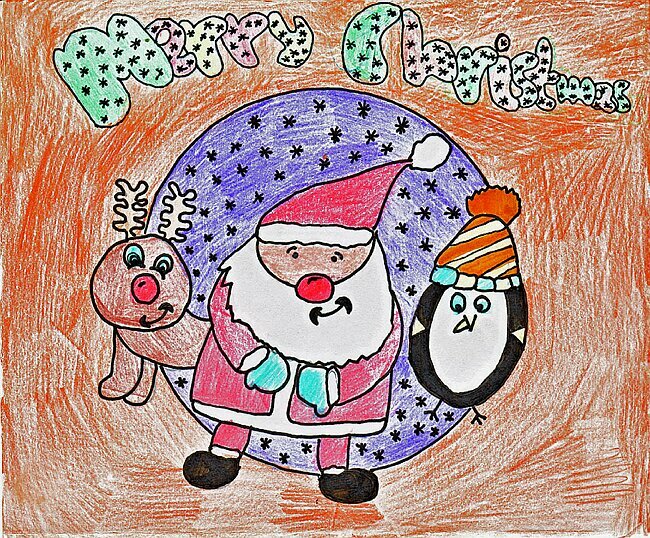 The above is the Key Stage 2 and overall winning entry by Heidi White of Class 5/6W in this years annual Christmas Card Competition run by the Parish Council, Village News and the Village Web Site in association with our Primary School. Key Stage 1 was won by Jessica Edmondson. We have the cards of all the class winners and runners up here. Our friendly committee would like to appeal to anyone who has a few hours to spare to help this very worthwhile cause. The group was started in 1972 by a small group of dedicated ladies and has grown to a larger committee supported by family and friends where needed. Over the years we have organised a great variety of events, raising many thousands of pounds to help in the fight against Cancer. Sadly, too many families are affected by this indiscriminent disease and we need to continue our efforts to help find a cure. If you feel you would be able to help and would like to know more about us, or come along to one of our bi-monthly meetings please contact one of our members. We would be delighted to hear from you. The Playground at Theydon Santa's Christmas Grotto day on Saturday 1st December was a total success with Santa greeting children in his grotto and many stalls plus a Christmas colouring competition.. Fiona Bradley for PAT said - "Even though we don't go out to make much of a profit on each stall (it's worth it to see the children turn up & enjoy themselves), we made enough to cover most of our annual expenses and to accrue some for the replacement of some of the older pieces of equipment." We have a whole set of photos of children enjoying the day here. ROYAL BRITISH LEGION POPPY APPEAL: The total of £4,203.27 was collected this year. Thank you to all who gave to the Appeal and thank you to all the collectors, new and old, who helped raise this excellent amount. 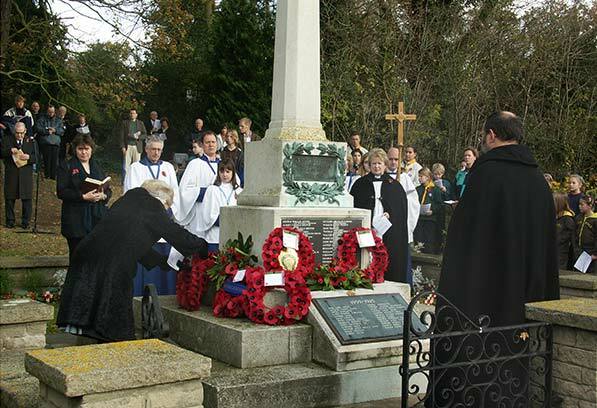 The Annual Remembrance Service at St. Mary's raised another £640 for the appeal. A.F. Hollingbery Poppy Appeal Organiser. Theydon Bois Friends of Cancer Research UK - Volunteer Fundraisers Our friendly committee would like to appeal to anyone who has a few hours to spare to help this very worthwhile cause. The group was started in 1972 by a small group of dedicated ladies and has grown to a larger committee supported by family and friends where needed. Over the years we have organised a great variety of events, raising many thousands of pounds to help in the fight against Cancer. Sadly, too many families are affected by this indiscriminate disease and we need to continue our efforts to help find a cure. Neighbourhood Watch: Since my last article in the Parish Magazine there has been an increase in anti social behaviour and nuisance youth calls to Theydon Bois especially the area of Coppice Row. I would urge parents to be aware of where their children are during the evenings and encourage them not to congregate outside Tesco's or in the bus stop opposite as large groups of youths can be intimidating. If youths responsible for anti social behaviour can be identified then they will be dealt with. A local 13 year old boy was arrested after causing a disturbance in one of the local shops in Forest Drive, after spending time in the police cells at Loughton he was released with a caution. A local 26 year old man was arrested in the early hours of 20.11.07 after attempting to gain entry to the Wine Rack in Forest Drive, he has since been charged and bailed to appear before Harlow magistrates Court. With The co -operation of the local community I am convinced that we can all put a stop to such anti social behaviour especially taking into consideration that certain area's of the village are now covered by CCTV which Police have access to. Other crime remains fairly low over the past two months, there was only one report of a dwelling burglary, three reports of vehicle crime, ten reports of criminal damage and one reported assault, together with a mixture of non crime incidents. Nationally there has been an increase in the theft of metal which is due to an increase in the value of scrap metal, commercial premises are generally targeted, two males were arrested in the past for this in Theydon, but I would still ask that any suspicious behaviour is reported to Police With the dark nights well and truly set in I would urge everyone to be cautious, there have been a couple of incidents within Essex recently of bogus callers preying on the elderly and gaining entry to the premises to steal from within. Please do not let anyone into your home unless you are absolutely satisfied with their identity, if you are concerned please call Police. The Neighbourhood Action Panel continues to meet at the Village Hall in Coppice Row with a cross section of the local community discussing local matters that affect Theydon, the next meeting will be in the new year. Policing priorities are set. if you are interested in attending please contact me. The officers responsible for your area are Pc's Ray Hull , Alan Lamb and Police Community support officers Lizal Scott & Jayne Rudolph all of whom work from Epping Police Station and can be contacted on the numbers below Epping Police Station : 01992 561212 ( Open Mon - Sat 0800-2200 & Sun 0900-1700) Neighbourhood Policing Team : 07779 317211. 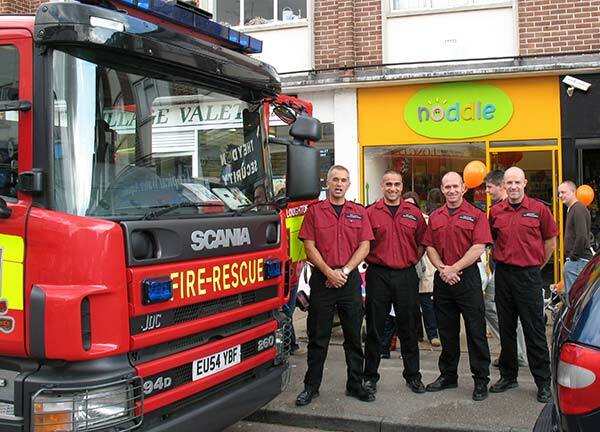 Finally I would like to wish all the residents in Theydon Bois a Happy & safe Christmas and New Year"
Children in the Theydon Bois had a rare opportunity to explore a real fire engine recently when Loughton Fire Brigade made a special visit to the village for the Grand Opening of new educational toy shop “Noddle”. Noddle is owned by village resident and mother of three Kate Penegar and sells traditional wooden toys and award-winning innovative toys and crafts, as well as an impressive array of award-winning educational games and learning resources aimed to help make learning English, Maths and Science fun for primary school children. “One of our guiding principles is to select the type of toy that parents remember with fondness from their own childhood and that grandparents will want to buy for their grandchildren; the kind of quality gifts that are very hard to find nowadays,” says Kate. “I also really wanted to stock educational workbooks and toys that support the National Curriculum as I rarely found them on the high street when my eldest started school. I think that if you can get children to love learning then that’s half the battle. 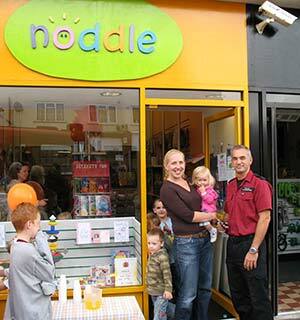 ” Noddle differentiates itself from other toy shops by refusing to stock products that don’t meet the ‘educational’ or ‘developmental’ requirement. By and large they do not sell the commercial kind of toy that can be bought in the bigger toy stores, unless it fits the bill". “We’re very proud of the products we have here, many of which are hard to find in stores or are only available in mail order catalogues. Everything here is not just educational, but fun and exciting for both children and their parents,” says Kate. As well as toys, games and crafts, Noddle also sells handcrafted greetings cards and offers an increasingly popular bespoke greetings card service, which allows customers to order one-off personalised handcrafted cards for that special someone. OPENING TIMES: Monday mornings: 9.00 am to 1.00 pm Tuesdays to Saturdays: 9.00 am to 5.00 pm Call 01992 814959 with any enquiries or to discuss a bespoke card order. The Rotary Club of Epping Forest now have a new base and meet at Queen Victoria Public house Theydon Bois - Tuesday evenings 19.15hrs. For the last 25 years the club has served the Epping District community with the motto Having Fun Helping Others. 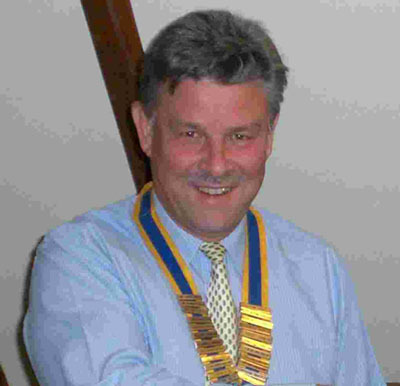 I can be contacted on 01992 574375 and President Peter (photo attached) on 07836 589697 to find out more about joining or helping or needing our help. In 2006 Playground at Theydon received funding to replace the flooring in the playground. One of the funders was the Big Lottery Fund who subsequently contacted us to say they were making a short PR film on the good causes they had given finding to & would we be wiling to be used. 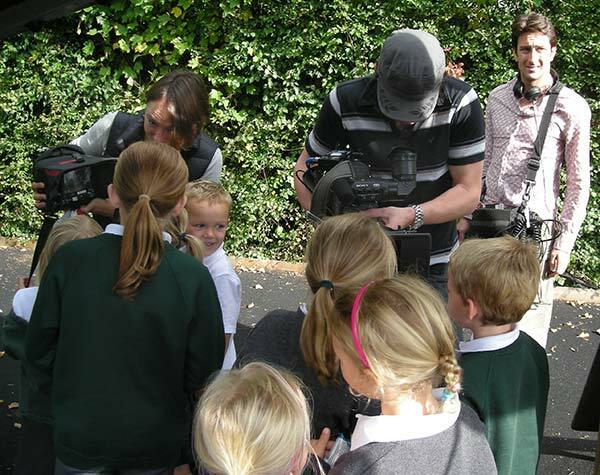 The Lottery people & film crew came down to the playground on 4th October. The committee members and their children were there to take part in the film.